A beautiful ballerina length party dress. The burgundy red, fitted bodice is made from luxurious silk taffeta and has short puffed tulip sleeves. It is trimmed with willow green to match the covered button fastenings and silk sash belt, which ties into a gorgeous bow at the back. 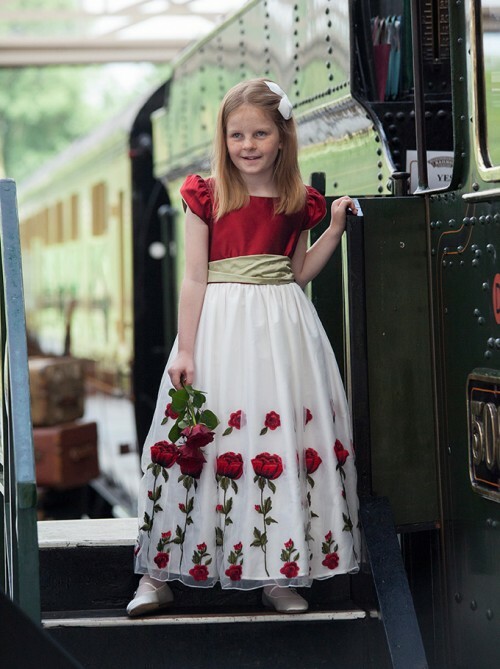 The stunning full and voluminous skirt is in soft tulle with red embroidered roses, over taffeta, has layers of tulle and has a generous petticoat. Also available with an ivory bodice.